Nature – Colour or Greyscale Monochrome -recognised by the Nature Division of the PSA. Payment will be made via PayPal to hpsinternational@hoylakephoto.org.uk. Special rates for Club entries of more than five members. Contact us at chair@hoylakeinternational.org.uk for further details. This definition applies to all sections with the exception that toned images are NOT allowed in Nature, Photojournalism or Photo Travel. A black and white work fitting from the very dark grey (black) to the very clear grey (white) is a monochrome work with the various shades of grey. A black and white work toned entirely in a single colour will remain a monochrome work able tostand in the black and white category; such a work can be reproduced in black and white in the catalogue of a salon under FIAP Patronage. Nature photography is restricted to the use of the photographic process to depict all branches of natural history, except anthropology and archaeology, in such a fashion that a well-informed person will be able to identify the subject material and to certify its honest presentation. The story telling value of a photograph must be weighed more than the pictorial quality while maintaining high technical quality. Human elements shall not be present, except where those human elements are integral parts of the nature story such as nature subjects, like barn owls or storks, adapted to an environment modified by humans, or where those human elements are in situations depicting natural forces, like hurricanes or tidal waves. Scientific bands, scientific tags or radio collars on wild animals are permissible. Photographs of human created hybrid plants, cultivated plants, feral animals, domestic animals, or mounted specimens are ineligible, as is any form of manipulation that alters the truth of the photographic statement. No techniques that add, relocate, replace, or remove pictorial elements except by cropping are permitted. Techniques that enhance the presentation of the photograph without changing the nature story or the pictorial content, or without altering the content of the original scene, are permitted including HDR, focus stacking and dodging/burning. Techniques that remove elements added by the camera, such as dust spots, digital noise, and film scratches, are allowed. Stitched images are not permitted. The final image must look natural. Colour images may be converted to greyscale monochrome. Infrared images, either direct-captures or derivations, are not allowed. Images used in Nature Photography competitions may be divided in two classes: Nature and Wildlife. Images entered in Nature sections meeting the Nature Photography Definition above can have landscapes, geologic formations, weather phenomena, and extant organisms as the primary subject matter. This includes images taken with the subjects in controlled conditions, such as zoos, game farms, botanical gardens, aquariums and any enclosure where the subjects are totally dependent on man for food. species taken under controlled conditions are not eligible in Wildlife sections. Wildlife is not limited to animals, birds or insects. Marine subjects and botanical subjects (including fungi and algae) taken in the wild are suitable wildlife subjects, as are carcasses of extant species. Wildlife images may be entered in Nature Sections of International Exhibitions. Photojournalism entries shall consist of images with informative content and emotional impact, reflecting the human presence in our world. The journalistic (story-telling) value of the image shall receive priority over pictorial quality. In the interest of credibility, images that misrepresent the truth, such as those from events or activities specifically arranged for photography or of subjects directed or hired for photography, are not eligible. Techniques that add, relocate, replace or remove any element of the original image, except by cropping, are not permitted. The only allowable modifications are removal of dust, scratches or digital noise, restoration of the existing appearance of the original scene, sharpening that is not obvious, and conversion to greyscale monochrome. Derivations, including infrared, are not eligible. The final image must look natural. Human Interest is defined as an image depicting a person or persons in an interactive, emotional, or unusual situation, excluding recreational and sports action. This year’s theme is Architecture. This theme includes buildings, structures such as bridges, statues etc. Close up images of parts of buildings, structures etc which do not give a sense of the whole or the place will receive low marks. .
What does “look natural” mean? Essentially, the photographer is a reporter in Photo Travel, Nature and Photojournalism. A reporter is supposed to tell the truth. Ask yourself whether you are telling truth, or whether, in your processing, you have changed it so much that you are NOT telling truth. Anything other than the truth is a Lie. Be truthful! Maker’s Name: The maker’s name and/or image title shall not be in the image area of the digital file. By entering this exhibition, you are explicitly consenting to the personal details you have supplied, including email addresses, being held, processed and used by the exhibition organizers for purposes associated with this exhibition. You also explicitly consent to such information being sent to organizations that have accorded official recognition, patronage or accreditation to this exhibition. You acknowledge and accept that entering this exhibition means that the status and results of your entry may be made public. Original Image Statement: Entries must originate as photographs (image-captures of object via light sensitivity) made by the entrant on photographic emulsion or acquired digitally. By virtue of submitting an entry, the entrant certifies the work as his/her own and permits the sponsors to reproduce all or part of the entered material free of charge for publication and/or display in media related to the exhibition. This may include low resolution posting on a web site and submission to PSA/FIAP for monitoring standards. 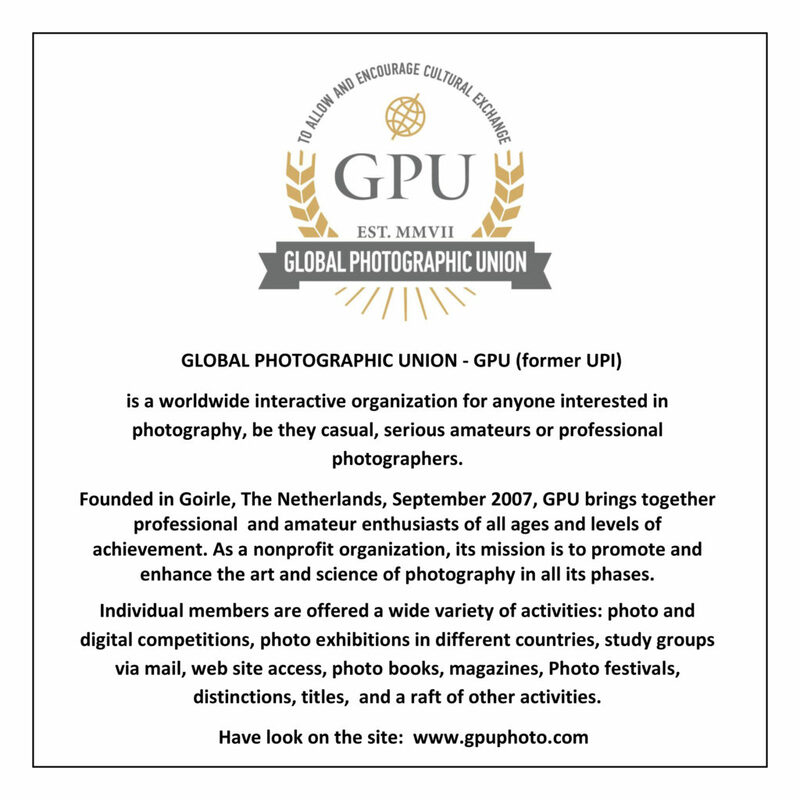 The exhibition and FIAP/GPU/PSA assume no liability of any misuse of copyright. Images may be altered, either electronically or otherwise, subject to divisional restrictions, by the maker. – that in case of sanctions following the non compliance with FIAP regulations, the name of the entrant will be released in any form useful to inform the breaches of the rules. It is recommended to leave the EXIF data in the submitted files intact in order to ease eventual investigations. The exhibition is open to anyone; however, an entry may be rejected when Hoylake Photographic Society, in its reasonable discretion, believes the entry does not conform to the exhibition rules and conditions. An entrant’s images will not be presented to the judges consecutively. An entrant’s four images will be distributed throughout four rounds of judging in that section. Distribution of images shall be in the same round order as submitted by the entrant. Entries must originate as photographs (image-captures of objects via light sensitivity) made by the entrant on photographic emulsion or acquired digitally. By virtue of submitting an entry, the entrant certifies the work as his own (aliases are not permitted). The entrant permits the sponsors to reproduce all or part of the entered material free of charge for publication and/or display in media related to the exhibition. This may include low resolution posting on a website. Note: Entrants who indicate that their images may not be reproduced or used “will not be eligible for awards” or inclusion in audio-visuals of the exhibition “and could be subject to disqualification” by the exhibition sponsors. The exhibition assumes no liability of any misuse of copyright. Images may be altered, either electronically or otherwise, by the maker..
No title or identification of the maker shall be visible anywhere on the face of an image entered in a PSA Recognized exhibition. May not be entered or re-entered in any section of the same Division Star Ratings class in that exhibition regardless of media, format, or title. 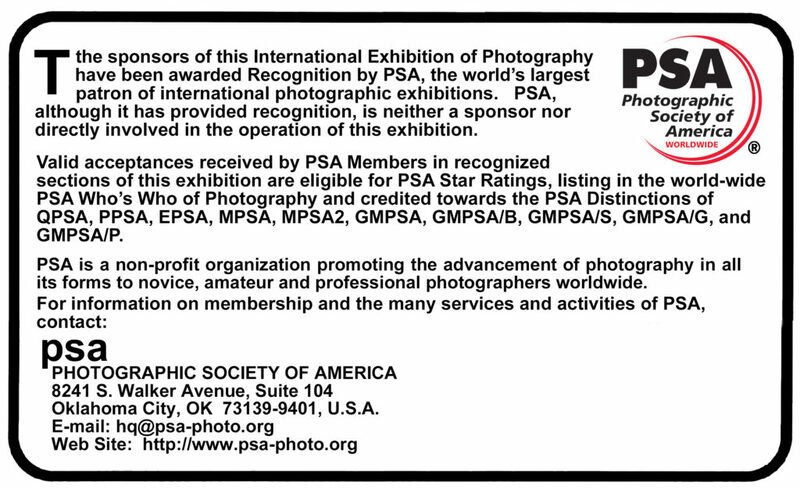 May not be re-titled for entry in any other PSA Recognized exhibition, including translation into another language. Images meeting the Monochrome Definition and non-manipulated color images from the same capture shall be considered the same image and must be given the same title. Exhibition Is Open: The exhibition is open to anyone; however, an entry may be rejected when the Exhibition Chairman, in his reasonable discretion, believes the entry does not conform to the exhibition rules and conditions. 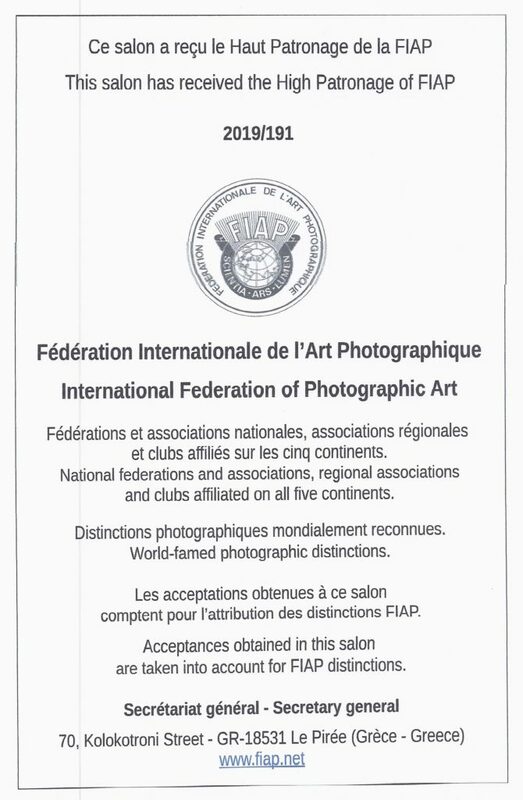 Those who have been placed under sanctions by FIAP, PSA or any UK club will not be permitted to enter this Exhibition. You do not have to be a member of Hoylake Photographic Society or of the Photographic Society of America to enter this competition . You may enter up to four images in each section. Saving your JPG file using sRGB color is recommended as it will provide better quality under the projection conditions used for judging the exhibition and producing the exhibition show.. Maximum image width (horizontal) is 1400 pixels. Maximum image height (vertical) is 1050 pixels (high). Smaller images are acceptable. Maximum permitted file size per image is 2mb. You do not have to follow any naming convention for your jpg files when you enter. The web pages properly renames your files to meet the needs of our exhibition software. An entrant’s 4 images will be distributed into 4 rounds and randomly sorted within each round. After you submit your entry, you will receive an email with your name, address, email, etc. plus the image titles you typed in. Please review and if you made any errors, please contact the Chairman – contact@hoylakephoto.org.uk to resolve. The entries are processed periodically and the status report indicates the time/date of the next scheduled status list up. The award ceremony will be held in September and some awards will be held back for presentation to those entrants who have signified that they will attend that ceremony.